Chocolate is a popular baking ingredient made from the seeds of the cacao tree. Chocolate is made from the seeds of the cacao tree. The cacao beans are harvested, split open, dried and fermented, further dried and then crushed into cocoa nibs, which are then further processed into cocoa butter (the fat component), chocolate liquor (the liquid component that contains not less than 50% nor more than 60% by weight of cocoa fat), and cocoa solids (the nonfat part of the cacao bean). These products are then reconstituted into a variety of chocolate products . Chocolate was first developed in Central or South America, though its origins are not completely known. 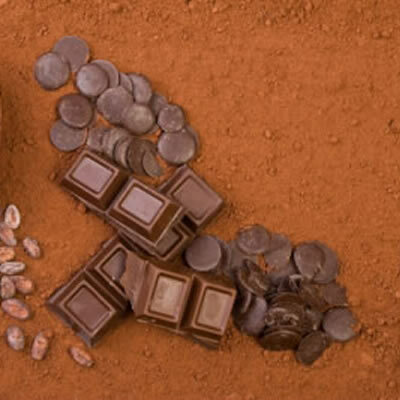 When Hernán Cortés conquered the Aztecs, he brought chocolate back to Spain, where it flourished. From there, chocolate spread throughout Europe. Today it is the number one preferred flavor of North Americans and Europeans. The major components of cocoa include: cocoa butter (oleic, stearic, and palmitic fatty acids), minerals (magnesium, potassium, iron and zinc), methylxanthines (theobromine and caffeine), polyphenols in addition to other compounds such as tyramine, tryptophan and serotonin1. The polyphenols in cocoa may reduce the risk of diabetes2, cardiovascular disease3, and neurodegenerative diseases such as Alzheimer’s and Parkinson’s disease4. The types of chocolate are classified according to the proportion of cocoa used in a particular formulation, which is regulated differently among countries. Table 1 shows the regulation of cocoa products from the Food and Drug Administration (FDA) in the United States. White chocolate is constituted of sugar, milk, cocoa butter, without cocoa solids, which is why the color is white. As shown in table 1, the U.S. government requires a 10% concentration of chocolate liquor for milk chocolate. It is hard to disentangle dark/semi-sweet/bittersweet chocolate, and they are often used interchangeably. In North America, bittersweet and semi-sweet chocolate must contain at least 35% chocolate. Chocolate is a popular baking ingredient. Dark/bittersweet/semi-sweet chocolate is widely used in all types of pastries, confections, and desserts and is also eaten out of hand. Another form of chocolate used in baking is unsweetened chocolate, also called plain or bitter chocolate, or baking chocolate. This is chocolate in its rawest form and is the same thing as chocolate liquor. A good coating chocolate must have the right rheology properties. The rheology of chocolate is affected by factors including particle size, the addition of emulsifier and the level of that addition6. Historically, soy lecithin has been used to control chocolate rheology in the confectionery industry; the use of emulsifiers has resulted in significant cost savings because it is less expensive than increasing the amount of cocoa butter in the product5. Other emulsifiers, like polyglycerol, polyricinoleate mono- and diglycerides, ammonium phosphatide, etc., have been used6. To better apply chocolate, bakers needs to know that chocolate does a lot more for baked goods than flavor them. It provides structure and absorbs moisture. Cakes or cookies with cocoa powder need less flour than do those without. Chocolate adds texture as well, due to its fat content. The baker also needs to know that the “% cocoa” label on a chocolate bar tells how much of the bar comes from the cacao bean (including chocolate liquor and cocoa butter), but it doesn’t divulge anything about the ratio of chocolate liquor to cocoa butter. Therefore, chocolate labeled with same percentage of cocoa may taste and perform differently. Gattward JN, Almoosawi S, Silva MDGCPC, Dantas PADS, and De Araujo QR Jr. Cocoa and human health: from head to foot—a review. Critical Reviews in Food Science and Nutrition 56.1 (2013): 1-12. Greenberg, JA. Chocolate intake and diabetes risk. Clinical Nutrition 34.1 (2015): 129-33. Buijsse B, Weikert C, Drogan D, Bergmann M, Boeing H. Chocolate consumption in relation to blood pressure and risk of cardiovascular disease in German adults. European Heart Journal 31.13 (2010): 1616-23. Title 21 Food and Drugs – Chapter 1 – Subchapter B Food and Human Consumption – Part 163 Cacao Products. Food and Drug Administration Department, Electronic Code of Federal Regulations, August 2016. Karnjanolarn R, McCarthy KL. Rheology of different formulations of milk chocolate and the effect on coating thickness. Journal of Texture Studies 37.6 (2006): 668-80. Ačkar Đ, Škrabal S, Šubarić D, Babić J, Miličević B, Jozinović A. Rheological properties of milk chocolates as influenced by milk powder type, emulsifier, and cocoa butter equivalent additions. International Journal of Food Properties 18.7 (2014): 1568-574.